As a corporate entity forced to accept responsibility for one of history’s worst industrial accidents, BP, the British oil company, will be digging deep over the next few years to pay off the Deepwater Horizon disaster, the oil rig blowout in April 2010 that claimed the lives of 11 men and flooded the Gulf of Mexico with an unmeasureable volume of crude oil and methane gas. It is a welcome step to hold corporate officers personally responsible for such “accidents.” Unfortunately, the message Mr. Holder may be sending is that the people at the corporate top, who drive the decision-making at the bottom, have nothing to fear as long as they dirty their hands only with paperwork. It is true that Deepwater Horizon exploded late in the night on April 20, 2010, but the decisions that set the disaster in motion happened months earlier and at a much higher corporate plane than a few white collars on the rig itself. The settlement will certainly crimp BP profits for a few years, but it continues a trend of hefty fines willingly paid because they have the net effect of terminating investigations that might tease out the truly responsible parties. The people who live along the Gulf of Mexico whose lives were so disrupted by the blowout and the families of the men who died on Deepwater Horizon deserve a complete and thorough prosecution. All parties must be held accountable for their actions and judgment. A payout that once again obscures corporate negligence is not enough. Don’t Call Me a Saint? In November the U.S. Conference of Catholic Bishops enthusiastically supported the canonization of Dorothy Day, co-founder of the Catholic Worker movement. Thanks to changes in the Vatican’s canonization procedures, the bishop in charge of promoting a person for sainthood must bring the matter before the regional bishops’ conference. In this case the job fell to Cardinal Timothy M. Dolan, archbishop of New York, where Day’s ministry was based. By all means hold these individuals responsible. However I don't sense the same righteous indignation over deaths such as the death of our border agents in fast and furious perpetrated by Mr. Holder or the Americans left to die in Benghazi? Are you curious where was the President? Who was complicit? What about criminals in government? I guess we only get those editorials if Republicans are in charge of government. If the corporate officers can be identified as Republicans or (gasp) conservative I am sure your righteous indignation would hit tsunami proportions! Companies are in business to make profits. This creates jobs and provides for wealth which provides the engine for the economy. Occupy Wall Street from the start was and is a George Soros confab designed to advance extreme leftist ideology. It has nothing to do with democracy or people's needs. It has nothing to do with Catholic social teaching which does not demonize capitalism. Lose the ideology and be Catholic in your assessment of events not like a corrupt media which assesses and reports on events based on their politics. There is a German saying: Politik als Ersatz für den fehlenden Glauben. Politics as substitute for missing belief. The Ten Commandments apply to all. Catholic moral principles apply to all. Leftist ideology applies only to the prisoners of their own ideas. While BP is properly being held responsible for its poor execution and rushed actions in the Horizon oil spill that resulted in the deaths of 11 individuals and major environmental damage, it is interesting to note the words of Eric Holder, who said, "I hope that this sends a clear message to those who would engage in this kind of reckless and wanton conduct." Yes, the excessively Fast and Furious conduct of BP's drilling operation that resulted in the human casualties was fully investigated and those held responsible fined and, where appropriate, charged with criminal homicide. Wouldn't justice be better served if we could say the same thing about the operation known as Fast and Furious, in which the transfer of assault rifles to Mexican drug cartel members, who subsequently used those weapons to kill American and Mexican law officials, was overseen by our own government? Unfortunately, the Obama administration is withholding access to documents that might point to that same Eric Holder's role in this botched and deadly fiasco. Fast and Furious and Benghazi? The election is over for four years so drop the political scams. Fast and Furious was a gun sting going bad like so many drug money buys. Go do undercover stings yourself. Benghazi was a CIA operation all the way. All operatives were, including Ambassador Stevens, CIA. Understandably the talking points did not want to say the consulate and safe house were CIA, You guys probably think they were there to hand out visas and trade brochures. Yes, Ed, Fast and Furious and Benghazi are over, as are the lives of the Americans killed in those screw-ups. But the proper way to end political scams is to expose them, not allow them to be covered up. The clear message we would hope Mr Holder would send is the one to himself, to help put an end to such "wanton and reckless behavior" as Fast and Furious constituted by the Obama administration by releasing rather than covering up materials requested by the congressional investigation of the botched operation. Otherwise we will have Holder participating in another act of Obamian hypocrisy, a deadly one, in the withholding of relevant information. Likewise with Benghazi. This time it involves the possible appointment of a Secretary of State. Was Susan Rice duped by whoever it was in the Obama administration that passed on to her the CIA summary with the reference to terrorism edited out, or was she aware of this attempt to hide the truth of the terrorist involvement? Whether she was merely deceived herself along with the rest of the American public or participated in the deception is relevant as to whether she is qualified to be our next Secretary of State should that recommendation materialize. A little truth would go a long way here. Walter.. Your GOP conspiracy people also tell us that a beefed up Marine protection would have prevented the Benghazi attack. A company of Marines, a battalion, A regiment.?? ?How did Reagan's 300 Marine deaths in Lebanon by one truck bomb terrorist work out for the GOP.? The BP explosion was a tragedy, and the most serious cosequences were borne by those who died, their families, and the many who live and work along the Gulf coast. Whatever civil compensation is made (of necessity, denominated in dollars) will never replace the lost lives. But the Editors speculate on criminal behavior, and "terminating investigations that might tease out truly responsible parties" and "the message Mr. Holder may be sending is that people at the corporate top, who drive the decision process, have nothing to fear as long as they dirty their hands only with paperwork." Let's think this through more carefully. Criminal statutes are intended to set a clear bright line around actions that breach the law. In the aftermath of the explosion, BP had zero popular support. The Administration had no reason to shelter BP or its senior executives, and every political incentive to be aggressive. So, I believe we are entitled to conclude that a thorough investigation was made. Prosecutors have a duty to investigate the available evidence, and to make decisions about prosecuting or otherwise resolving a case. 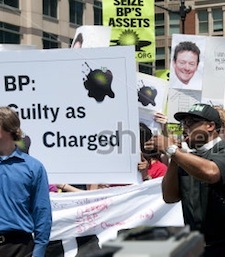 After investigation, the government with all its resources felt that certain criminal charges could be asserted against BP and certain individuals, and apparently persuaded BP to settle on those charges rather than procede to a courtroom. The Editors' speculations about criminal behavior by other individuals, without any supporting evidence or individual names, discredits both the government officials at every level who handled the case, and individals at BP who, after invesigation, were not charged. At what point does such speculation become specious, or slanderous? Yes, corporations have their cultures, and culture-setting starts at the top, with the board of directors and the CEO. But culture-setting is not itself criminal activity. As to who pays for the misdeeds that did occur, those billions of dollars in fines and cleanup costs directly reduce the profits of BP's shareholders-the very ones who profitted from BP's operatons up to the explosion. Even before any formal penalties were assessed, the stock price reflected that reality. The marketplace exacts its penalties swiftly and accurately. Those shareholders included every substantial decision-maker in BP management, and every other person or entity with a finacial interest in BP's operations, including quite a few union pension funds, college endowments, and charitable foundatons. To what degree was each of them complicit in BP's culture and decision-making? Perfect justice may not be achieved in this or any other case, but we need to avoid speculations that serve no purpose other than to divide us. Has Dorothy Day been carefully vetted by the USCCB? This article also appeared in print, under the headline "Current Comment," in the December 10, 2012 issue.